Wrestler Hulk Hogan at Phillies spring training. 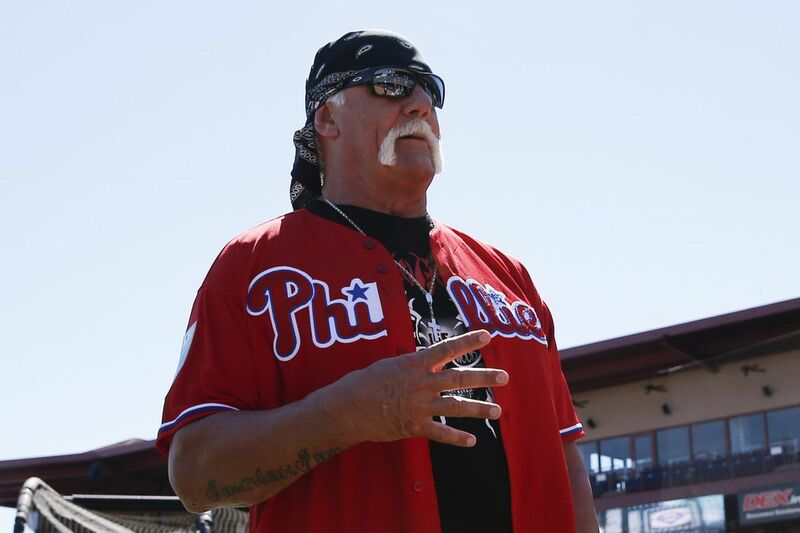 CLEARWATER, Fla. — Hulk Hogan, the biggest star in the history of professional wrestling and a pop-culture icon, put on a Phillies jersey Friday morning and felt a bit insecure. He came to spring training as a guest of bullpen coach Jim Gott and was asked to speak to a group of Phillies pitchers. Hogan has not wrestled full time in more than a decade, and most of the Phillies, who have the youngest roster in baseball, are too young to remember Hogan leveling foes with his trademark leg drop. He once wrestled in front of 90,000 fans but still didn't know what type of reaction awaited him on a small baseball diamond outside Spectrum Field. "I was kind of nervous," said Hogan, who has a home in Clearwater. "I didn't know if these young kids knew of my career or followed me. But they all seemed to know the history that follows me around. They're great kids. Very respectful. It's really cool to hear, 'Hey, Hulk, we want to do what you did.' It was really neat." Hogan told the Phillies pitchers that he once dreamed of being one of them. He pitched and played third base through high school. His dad was a baseball fanatic, and the sport was Hogan's first love. The winning run he allowed in a crucial Little League game still haunts him. His baseball dreams ended in high school when he broke an elbow chasing a ground ball. His arm was never the same, and the injury led him to quit baseball and pursue wrestling. It was the best thing that ever happened to him, Hogan said. "I just told them to stay healthy and keep doing what you're doing," Hogan said. "Just stay on track. I didn't want to go into some big, long dissertation or preach to them or anything. These kids are on track. They're here on this major-league club — believe me, they're on track." Hogan, wearing a red No. 11 Phillies jersey, later hung around the batting cage with Gabe Kapler and Charlie Manuel. Despite having knee and hip replacements and nine back surgeries, Hogan said he often takes swings at the cages down the road from the Phillies' complex. Being on the field, he said, was infectious. He talked at length with Manuel, who was a star slugger in Japan at the same time as Hogan was wrestling. "My career in Japan was just as big as it was here in the States," Hogan said. "They didn't call me Hulk Hogan there. They called me Ichiban. They called me No. 1. And the No. 1 Japanese wrestler, a guy named Antonio Inoki who fought Muhammad Ali, was my partner. And Charlie was over there when I was wrestling. And he remembers the matches; he remembered the buildings. We knew a lot of the same places. It was kind of crazy to have that conversation with him." Hogan kept his speech short with the pitchers but he could have told them what to expect in Philadelphia. It has been more than three decades, but Hogan still remembers how he felt when it was time to drive up the ramp that led out of the old Spectrum. "I used to get sick to my stomach thinking about leaving the building because the fans would be trying to turn my car over when I was a bad guy," said Hogan, who broke into wrestling as a "heel" in the late 1970s before becoming the industry's biggest star. "The good memories at the Philadelphia Spectrum are that it was so loud. It used to make my jaws water. It's kind of like I'd smell good food or something — my jaws would water. It would get so loud in the middle of that ring with that rumble in the building that it would make my jaws water. And then if I was getting beat up by the bad guy, I would reach out for help; the fans would try to come toward the ring. Nothing but good memories about Philly." The Phillies sent righthanders Franklyn Kilome and Jose Taveras, lefthander Ranger Suarez, infielder Eliezer Alvarez, and outfielder Dylan Cozens to minor-league camp. Cozens had four hits in his 21 at-bats and struck out 11 times. He will start the season at triple A, a level where he struck out 194 times last season. The 6-foot-6 outfielder has the most raw power of any hitter in the organization but showed this spring that there is still plenty of work to be done. Rhys Hoskins had an RBI double and an RBI single. … Jake Thompson pitched three innings in relief and his role for this season seems uncertain. He could be transitioning to the bullpen but also could start at triple A. … Pittsburgh's Jordan Luplow homered off Hoby Milner as the lefthanded sidearmer continues to struggle against right-handed hitters. …Vince Velasquez starts for the Phillies on Saturday against Tampa Bay.